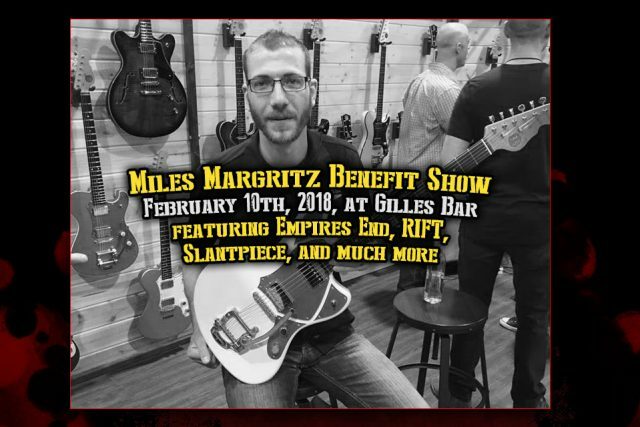 Miles Margritz benefit show featuring Empires End, Rift, Slantpiece, and more. Live from Gillies Bar! Just last month, December 20th, right before Christmas, Miles Margritz was involved in a terrible car accident. As I’ve read, via Kearney Hub, Miles was at the intersection of Highway 281 and Old Potash Highway, Grand Island, NE, when the driver of a stolen Dodge Challenger, that was traveling over 100 m.p.h. hit Miles’ vehicle head-on. If you would like to learn more about the accident, click here. Miles suffered a number of serious injuries and he is very lucky to be alive. He has a long road to recovery ahead of him and has been making great progress. To help, Gillies Bar has teamed up with many local area bands to raise money for the Margritz family. On February 10th, 2018, Gillies will be hosting the “Music For Miles” benefit event. The benefit will feature… Empires End, Rift, Slantpiece, Lawnmower Dogs, Cruz Control, Free Booze, Range Maggots, and Slow Stoics. Ten bucks and you get a full day of live music, every dollar goes directly to the Margritz family. There will be great food on the menu, raffles, and auctions. One of the items you can win is an Epiphone SG guitar with upgrades like Grover locking tuners, D’marzio D’activator pickups, and strap locks. For complete details, please visit the official Facebook event page. Previous articleLive in the midwest? Get ready to travel! SLAYER Farewell Tour dates announced. Next articleHellyeah DUDE!!! Municipal Waste are playing The Lookout Lounge in Omaha. Local bands TBA.